VALLEJO, Calif. /California Newswire/ — Down the rabbit hole! 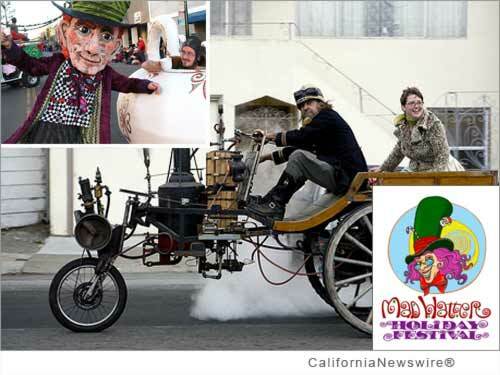 The City of Vallejo, Calif. has gone Mad for the month of December 2014 – Mad Hatter that is – with its popular "Mad Hatter Holiday Festival" that attracts thousands to the historic downtown district with its whimsical and fire-shooting Wonderland recreation that turns the city into a fantasy world for children and adults alike! This year celebrates the Festival's 5th year anniversary with city-wide participation – creating positive exposure for Vallejo and contributing greatly to the efforts in revitalizing the Downtown. Events will be held Saturday, December 6, 2014 through December 25, 2014 in Vallejo, Calif., in the Downtown Historic District (Wonderland Hotline: 844-344-8793 – phone active starting October 5). Wonderland Festival Activities begins at 2 p.m. in Unity Plaza, downtown Vallejo. Tree Lighting Ceremony starts at 6 p.m.
Lighted Boat Parade starts at 6:30 p.m.
Mad Hatter Costume Ball starts at 7:30 p.m.
Art mobiles, fire-shooting snails, dragons, and horses light-up Vallejo's streets – hundreds of marching and dancing Maritime Academy Cadets grace the downtown, attendees donned with top hats and Victorian attire come in droves to celebrate Wonderland once again. There is a 5 foot Santa G-Nome that shoots fire from the top of his head thirty feet into the air, giant multicolored glowing wagon wheels, the Mad Hatter, mouse, Lion King, Cheshire Cat, as well as roving Queens and Duchesses, along with the white rabbit – an adult and children fantasy Wonderland that continues on weekends throughout the month of December. The Vallejo Naval & Historical Museum will be presenting "Gazing Through the Looking Glass," an art and interactive exhibit with notable book illustrators and painters of "Alice in Wonderland" from December 6, 2014 to January 6, 2015. The Grand Victorian Homes Tour takes place on Sunday, December 14, from 3-7 p.m. In addition, the Libraries will be hosting storytelling and readings from the classics: "Alice in Wonderland" and "Through the Looking Glass." Wonderland activities are celebrated with Tea Parties at merchant stores, at recreational parks and in City Hall! Find us on Facebook: Mad Hatter Holiday Vallejo: https://www.facebook.com/MadHatterHolidayVallejo . Our YouTube video produced by WhatSF, a weekly television program in San Francisco, has a growing viewership of over 100,000: http://youtu.be/jN6MhLHYFrI . For more information contact: Frank Malifrando, 415-533-1522.